Depression is the emotional feeling of low spirits, sadness and loss of hope. It is something all of us go through at one time or another. In most cases, it is mild and does not warrant any form of treatment aside from rest or talking to someone about your worries. In some cases, however, this feeling may develop into something that never seems to go away. This type of depression is caused by a combination of serious environmental and psychological factors. In some instances, the predisposition can be passed from parents to kids through genes. 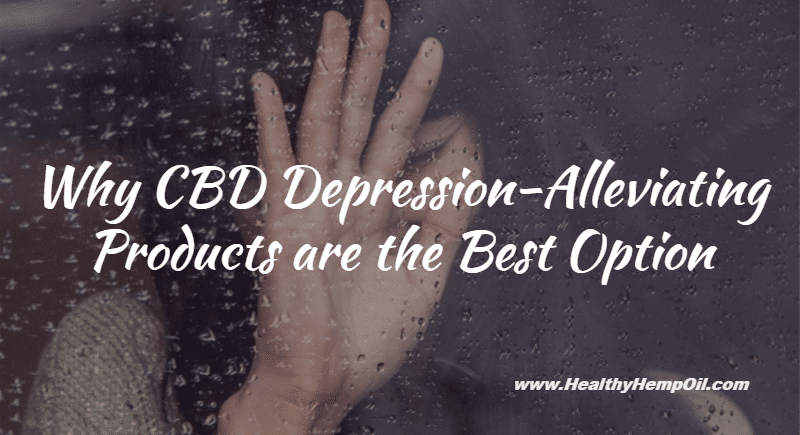 Regardless of the cause or type of your depression, your hope could be in CBD depression-alleviating products such as those sold at Healthy Hemp Oil. Aside from the feeling of low spirits, hopelessness and sadness, other symptoms that can help you tell if you or someone you know are depressed include poor appetite and inability to fall asleep. You may also experience fatigue, inability to concentrate, and loss of interest in everyday activities. In general, those with severe depression lack the drive to carry on with their normal lives. Nevertheless, different people have unique ways in which they express depression. Contrary to what you might think, this is an illness that is far from uncommon. It is only that many of us fail to realize that we are victims, and when we do, we don’t give it the attention it deserves. In the U.S, major depression is among the most common psychological disorders. Women are 70% more likely to suffer from major depression than men. It is estimated that about 6.7% of the adults in the U.S experience depression. That is about 14.8 million American adults in a given year. Additionally, it is estimated that 3.3% of 13- to 18-year-olds have suffered from a debilitating depression attack. There are many products in drug stores meant to treat both mild and chronic depression. Most of these, usually referred to as antidepressants, act by changing how the body’s hormones affect the activity of the brain and, therefore, the way you feel. Antidepressants are thought to help only 2 out of 3 of people who use them. Even in those who find them useful, the side effects cannot be ignored. For instance, if you are going to use them for a long time, the pressure put on your kidneys to clean the blood of the chemicals is immense. They are also hugely addictive. It is common for patients to experience withdrawal symptoms such as dizziness, headache, nausea and even hallucinations when they stop taking them. Recent studies have even suggested that there is a rising rate of suicide associated with the use of antidepressants. Antidepressants also demand a strict intake schedule. Failure to adhere to the right dosage and timelines might result in illness or even more destructive side effects. CBD, or cannabidiol, is one of the about seventy active elements found in the hemp plant. While CBD is extracted from the hemp plant, it is not psychoactive. In fact, it is one of the best remedies for psychosis. It is equally effective in treating depression. Unlike the pharmaceutical medications for depression, hemp or CBD oil have few side effects. It does not matter whether you take it in large doses or more frequently. Its effect on the body is also quick. It does not take long before you start feeling CBD’s effect on your depression. Who Should use CBD to Manage Depression? CBD can be used by anyone to manage depression. It is important, however, to consider other characteristics such as pregnancy or other diseases. In such cases, it is advisable to consult your doctor or medical caregiver. It is also important to seek advice in case you want to move from pharmaceutical drugs to hemp oil. Your doctor or medical caregiver is based placed to advise you on these issues given that they understand your condition better than anyone else. It is also a legal requirement in many jurisdictions that a doctor writes a prescription for you to use CBD products. The sale and use of CBD oil have been legalised in all 50 states of the U.S., and it is readily available for sale to people who are above the age of 18. However, there are still legal differences from one state to another regarding the type of ailments that can get the prescription for CBD. It is important to find out what the law in your state says about treating depression using CBD oil. If you are outside of the USA, it is equally important to ask, is CBD legal in your country? When you or someone you know suffered from depression, what remedies were available? What challenges did the treatment bring? Were CBD depression-alleviating remedies something that was considered? This entry was posted in Research & Science and tagged Depression & CBD.